Generally speaking, when large and powerful nations go to war with each other, they generally use weapons or weapons systems designed themselves or by close allies. Nations such as the United States, Russia, China, Great Britain, and France are overwhelmingly equipped with domestically designed and built weapons. Some smaller and traditionally neutral nations, such as Sweden and Switzerland, have their own defense industries and, to one degree or another, develop much of their own weapons. Second and third world nations, or nations closely allied with the superpowers of the world (such as Japan), may or may not have their own domestically made weapons. Most likely, they rely on weapons sold or given to them by their allies or from arms dealers selling obsolete weapons from years past. However, in 1982, something strange happened. The world discovered the Exocet missile. This weapon was designed and developed by France and was sold to Argentina and Great Britain (among other nations). What no one really expected was that these French missiles would be used against one of France’s oldest and strongest allies. In 1982, the military government of Argentina was on shaky ground. Its repressive practices at home were beginning to backfire, its economy was in a shambles, and the nation was becoming a world pariah due to its human rights abuses. 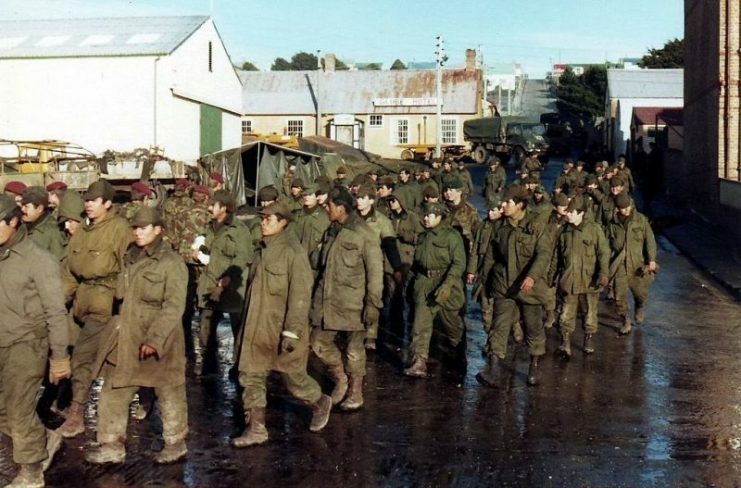 In order to divert the attention of its people from the problems within the country, the Argentinian military junta, headed by General Leopoldo Galtieri, decided to invade the Falkland Islands (known in Argentina as the Islas Malvinas) and the Georgia and South Sandwich Islands – all of which had been occupied and claimed by the United Kingdom since 1833. Argentina had long had claim to the islands and erroneously believed that it would have the support of nations around the world when it asserted its claim by military force in April 1982 and briefly occupied the islands. The British Prime Minister Margaret Thatcher made it clear that she was going to take the islands back by force, and the world new a battle was coming when the British fleet steamed from England. The war ended in Britain’s favor, and the battle on land was a total rout. The British forces were more experienced, well-trained, and equipped and were simply too much for the Argentines. However, at sea, the Argentine Navy and Air Force had a “great equalizer”: the French Exocet missile, work on which had begun in the early 1970s. Exocet is a transliteration of the Latin for “flying fish,” and, just like its name-sake, the Exocet was designed to fly just above the waves, making it difficult for both enemy radar and eyes to see. There are five Exocet variations: the AM38 helicopter-launched version; the AM39 air-launched version, which can be fitted to a variety of fighters; the surface-launched MM38; the surface-launched MM40; and the submarine-launched SM39. The SM39 is housed in subs’ torpedo tubes. 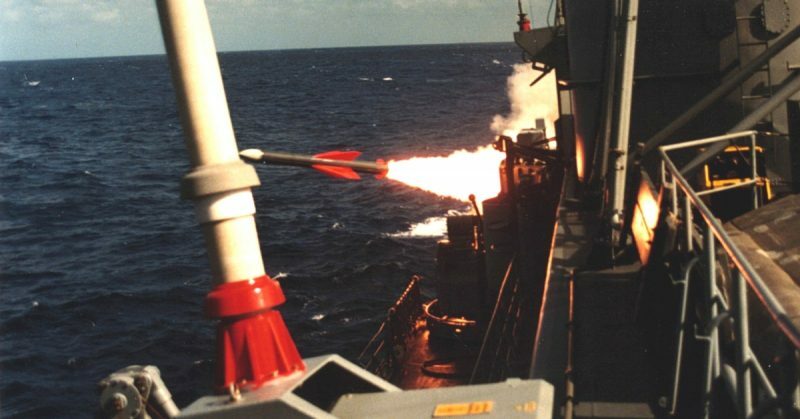 It then surfaces at a steep angle and becomes airborne, then behaves as the final variant, the MM40 surface-launched missile, which is used on warships and coastal emplacements. The MM38 is an earlier version of the MM40, which was developed in the United Kingdom under license. 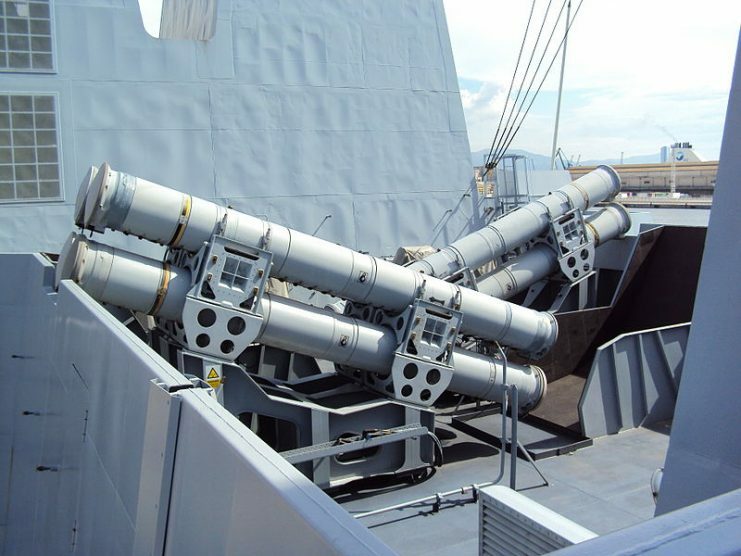 The “MM40 Block 3” is the latest Exocet model and is being used by nations from Greece and Finland to Peru. The range of the missile varies from type to type. 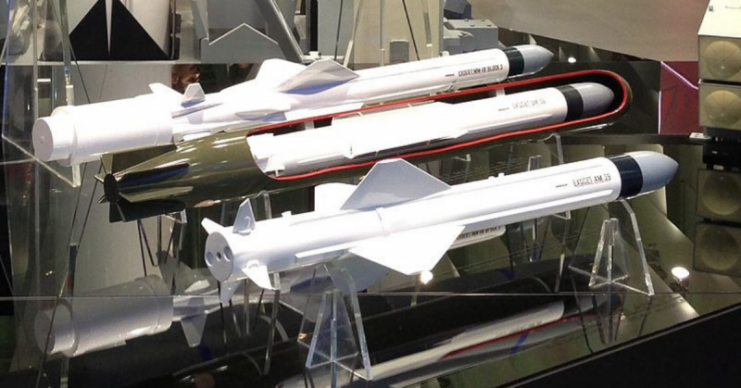 The air-based missile has a range of up to 40 km, whereas the land/ship based variants have ranges of 72-180km. The missiles’ top speed is just under Mach 1 – 1,134 kph, or 705mph. Exocet weighs 1,480 lbs and is 15.5 feet long with a diameter of 1 ft 1.7 inches, with stabilizing fins 3 feet 7 inches in length. The warhead on the modern MM40 Exocet is 363 pounds of high explosive. 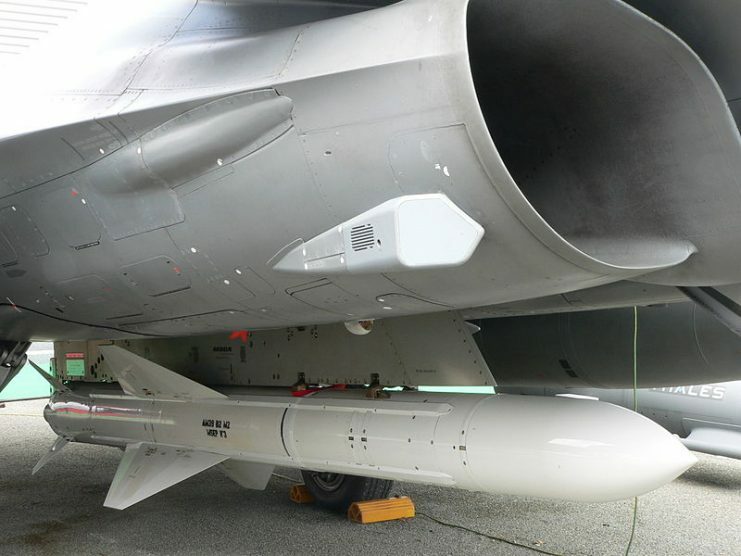 The missile was developed by Nord Aviation, then mass produced by the French state-owned aerospace entity Aerospatiale. 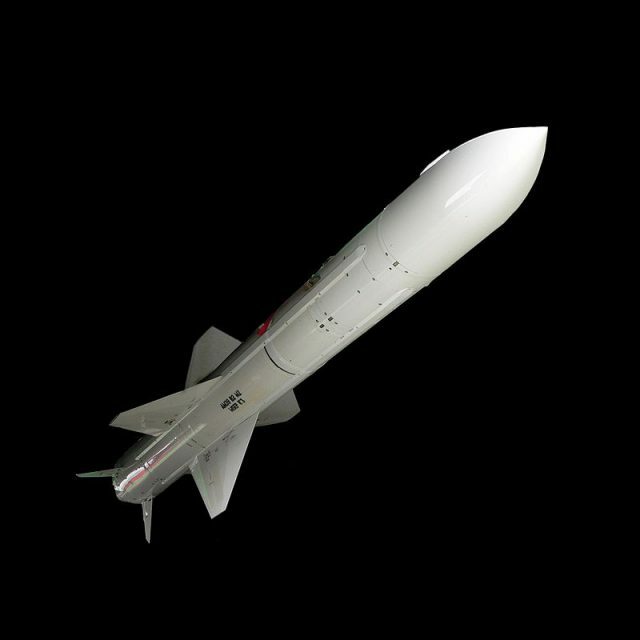 Today, the weapon is built by MBDA Missile Systems, a conglomerate which includes Airbus. The missile is guided to its target by inertial guidance and radar homing systems. The British were well-aware of the threat posed by the Argentine Exocets. Nonetheless, on May 4, the British destroyer HMS Sheffield was lost to Exocet fire. Twenty British seamen lost their lives; the ship, though not sunk immediately, had to be abandoned and eventually sunk. Though the British had sunk the Argentine cruiser General Belgrano on May 2, it was not until the sinking of HMS Sheffield that the British Isles were truly aware of the danger in the South Atlantic. 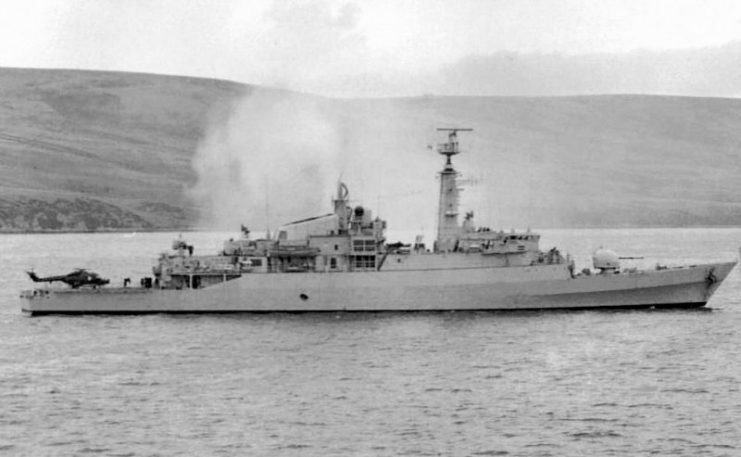 HMS Sheffield was the first British ship to be lost in combat since WWII. There is debate among naval historians about the success of the Exocet in the sinking of HMS Sheffield. Some crewmen say the missile exploded, although others say that the fire was caused by its propellant and that materials inside the ship itself caused the damage. 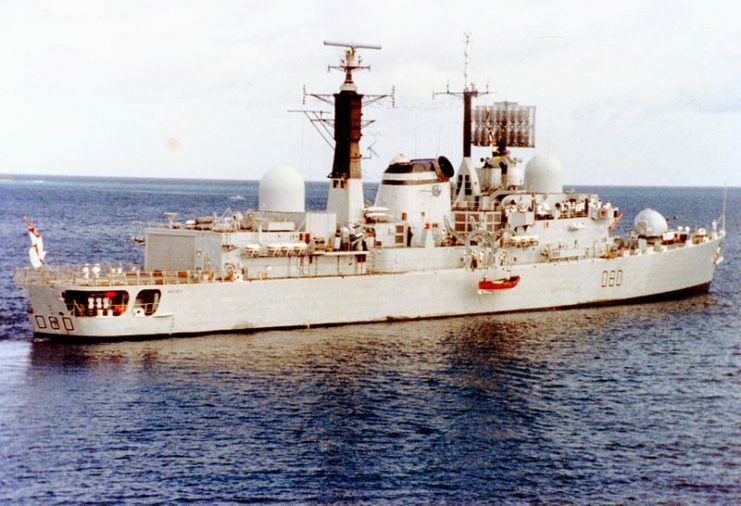 It was also discovered that HMS Sheffield had not taken proper evasive manoeuvres prior to the attack, and/or had not received warnings of its approach. A view of damage sustained by the guided missile frigate USS STARK (FFG-31) when it was hit by two Iraqi-launched Exocet missile while on patrol in the Persian Gulf. Going into the war, the British, who also possessed Exocets, were worried that inadequate defenses against the missile might cause the conflict to drag out or for the Argentines to win. 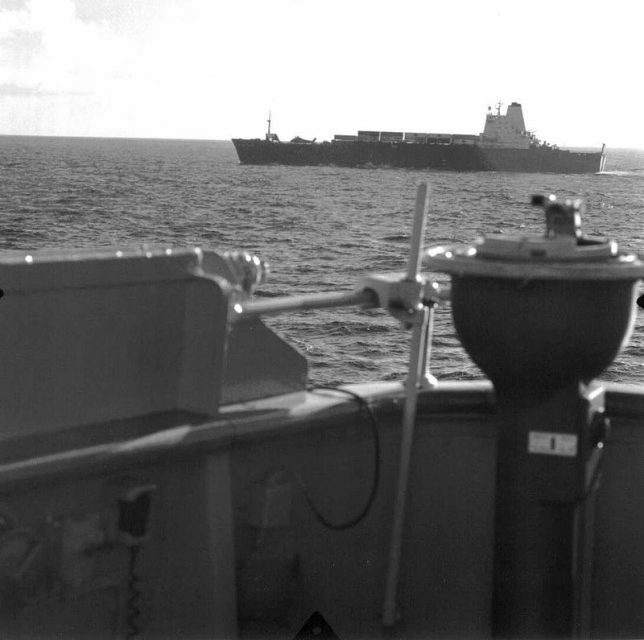 Two other British vessels – the converted container ship/helicopter carrier Atlantic Conveyor and the destroyer HMS Glamorgan – were hit by Exocets. Atlantic Conveyor eventually sunk but HMS Glamorgan survived, thanks to quick action by its crew. 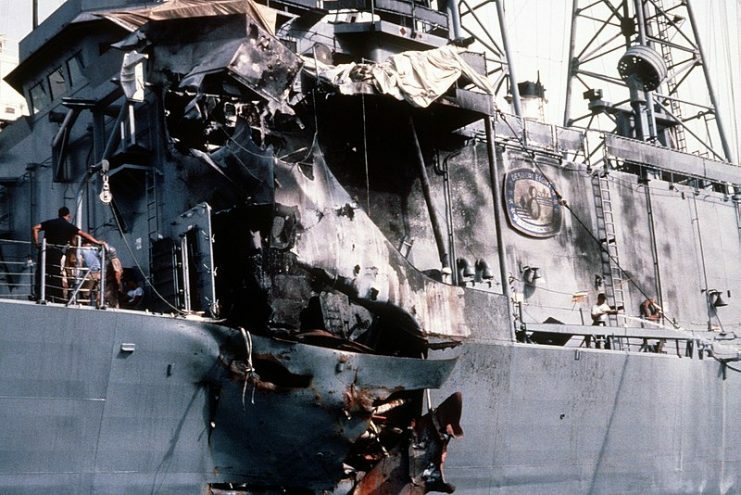 Five years later, USS Stark was struck by two Iraqi Exocets during the Iran-Iraq War. Thirty-seven U.S. servicemen died. The attack caused a review of navy defensive procedures and anti-missile weapons systems. Around the world, the Exocet system is still deployed by at least 32 nations, many of them smaller powers. The Exocet lets them punch way above their weight-class.